Built in the USA, Trinity yacht MUSTIQUE was designed for stately and comfortable charter cruising. 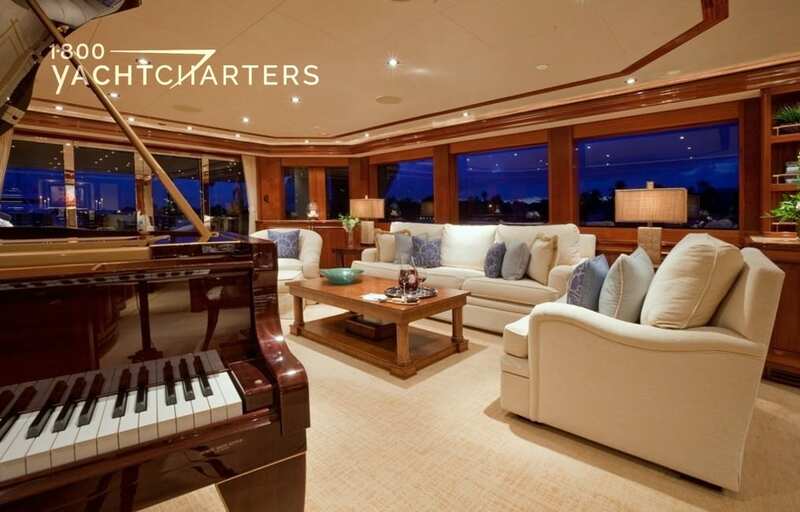 Noise and vibration are never an issue on this 180 foot megayacht, thanks to the engineering specialists at Van Cappellen. Her classic interior design by Dee Robinson fuses rich mahogany wood against ivory and cream finishes, and results in an elegant presentation. Two words can best describe motor yacht MUSTIQUE: stately and timeless. With accommodations for 12 charter guests in six staterooms, Trinity yacht MUSTIQUE offers a full beam master suite, featuring a private study and his and hers en suite bathroom. The VIP stateroom is also full beam cabin. Guest cabins include three doubles, each with a king size bed, and a twin cabin. All staterooms feature entertainment centers and bathrooms ensuite. 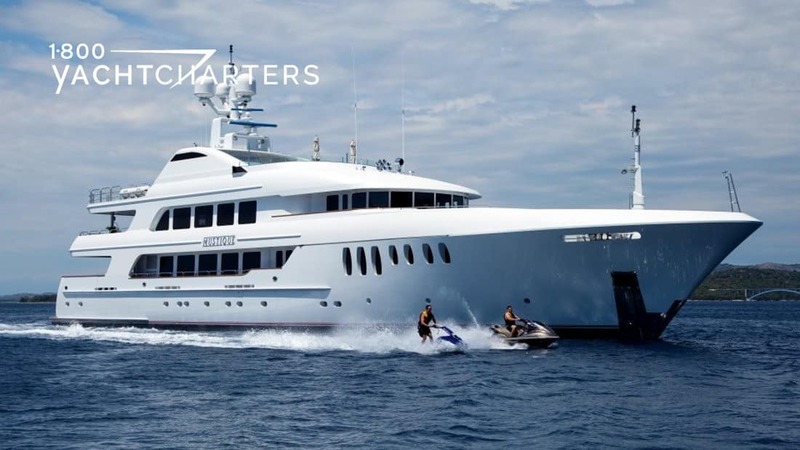 This imposing superyacht boasts four living levels – a sunny flybridge, a pilothouse and command helm, the main deck, and the accommodation deck. The full beam flybridge/sundeck offers inspiring views of the sea, and serves as a casual relaxation area, with room for alfresco dining, and sunning. Sun lounges, full wetbar, shaded circular settee, and a spa tub make the flybridge the center of outdoor entertainment. 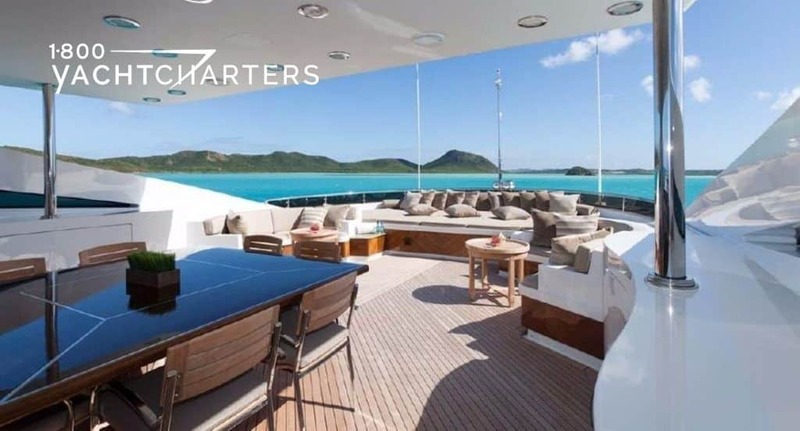 With so much deck area dedicated to outdoor enjoyment it is easy to see why this yacht is so popular for Bahamas yacht charter vacations. To escape the sun, a nearby skylounge offers air conditioned comfort and commodious furnishings. Large windows bath the room in light, and several entertainment areas makes this a favorite evening gathering place. Amenities include a 60″ TV, couches and easy chairs, conversation nooks, full bar and a gaming table. The formal salon is situated on the main deck. 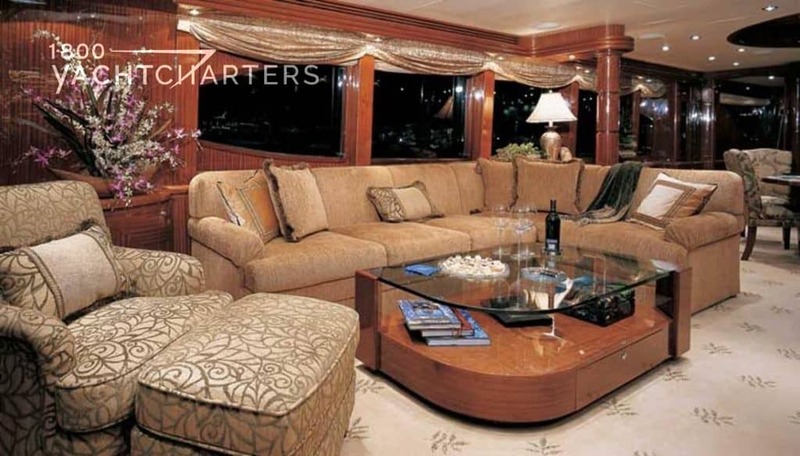 Here, the yacht’s true elegance is on display, as this is the room where the dark mahogany woods are so well accentuated by cream carpeting, soft lights overhead, and light tan colored chair backs. A fun focal point is the Yamaha piano for live entertainment. Did you Know? The Bahamas gets over 315 days of sunshine a year!